It’s a secret, a wonderful secret. 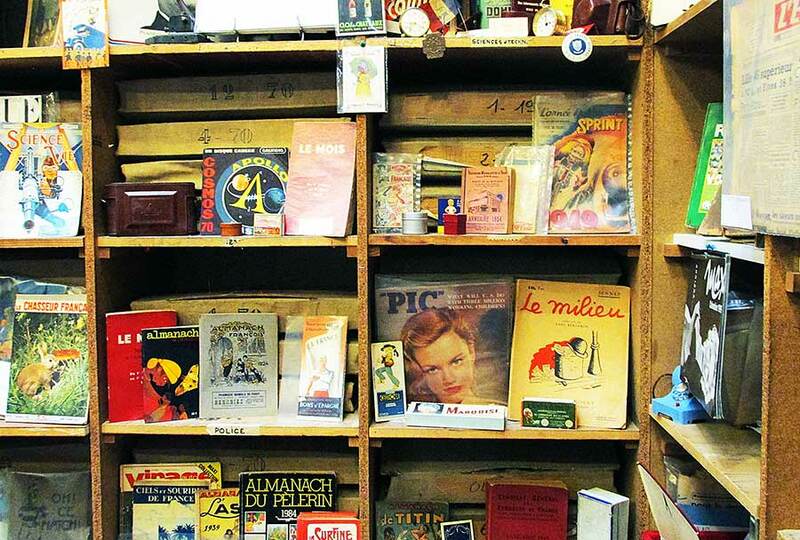 It’s La Galcante, a Parisian shop probably like none you’ve ever been in before. It’s books and magazines, dust motes floating in pastel lemony light, soft jazz from the radio and the musty-lovely perfume of old paper. It’s magic. Come inside with me. When I’m traveling, nothing is more wonderful to me than stumbling across a little-known treasure that most tourists never find. It’s those secret places, addresses passed from friend to friend, with instructions to “turn right and look for the blue door,” that put you behind the scenes in a new city and make you feel like a local. So when a friend told me about La Galcante, a shop that specializes in what they call “Old Press,” I was intrigued. The name itself is a play on words. It’s a combination of galerie (gallery) and brocante (a kind of flea market or second-hand business). As a flea market and vintage junkie (more about that here), I was eager to see it for myself. 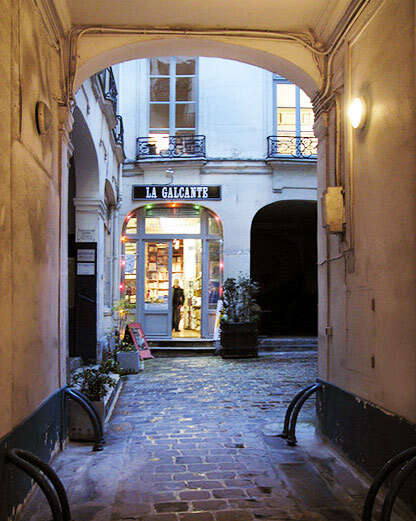 The entyway to La Galcante is a perfect Paris scene. Let yourself get drawn in. It’s not the kind of place you stumble across. You have to know where to look. You must be told that it is in the 1st Arrondisement, just a few streets from the Louvre. You are told to walk down Rue de l’Arbe Sec to #52 and look for the blue door with the heavy brass knocker. Through that door, you’ll step into a shadowy corridor, maybe with a bike or two leaning against the old walls. At the end of the cobble-stoned corridor, there it is, tucked into a corner of one of those fabulous little Parisian courtyards that make you think you’re in an Audrey Hepburn film. Step through the arched glass doors and you discover yourself surrounded by seven million bits of paper—stacks of paper, shelves and tables and boxes and crates of paper, towers of paper. It’s a bit overwhelming. But let yourself sink in and be surrounded. The treasure hunt is about to begin. The shop’s “Old Press” specialty includes newspapers and broadsides from the time of the French Revolution to the present. Most of the collection dates from the 1850s forward, with the most popular requests being for items from the 1920s to 1970s. But they also stretch their mission to include most things paper. Beyond the newspapers and collections of old New Yorker magazines and the entire run of Paris Vogue, you’ll find calendars, vintage advertising, catalogs, broadsides, prints, etchings, cigarette cards, vintage maps. 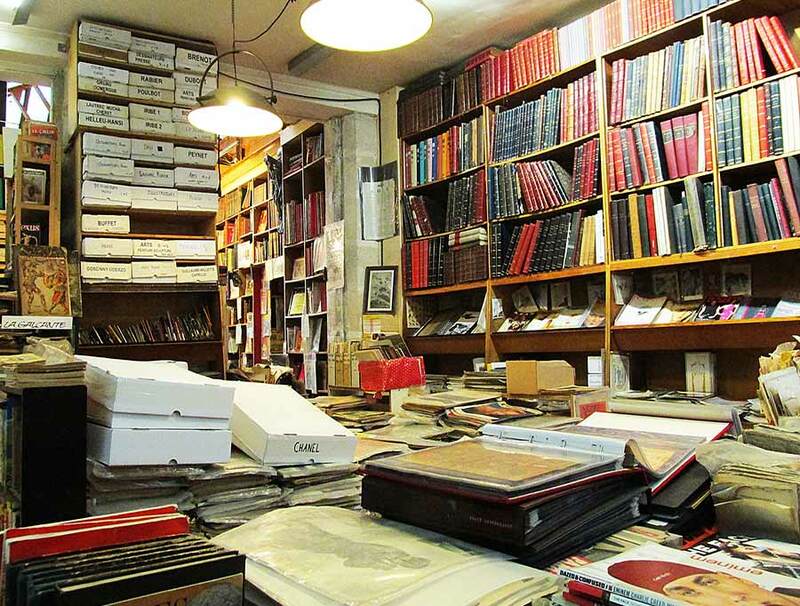 Wall-to-wall, floor to ceiling shelves and drawers are filled with everything paper-related at la Galcante. When you first enter the shop, you’re met by walls lined floor-to-ceiling with shallow drawers and shelves stacked with white boxes full of flat files. These are all carefully labeled: Piaf, Hemingway, Hitchcock, Bowie. Those are stuffed with assorted and sorted ephemera about whomever you are currently obsessed with, including articles, photographs, drawings and magazine stories. Others are labeled with subjects like Suisse Chocolat, Chansons, Mode Masculines. Still others merely have numbers, with catalogued newspapers someone will direct you to if you ask. Wend your way through the narrow aisles towards the back, where you’ll find a perfect Paris atrium ceiling, pouring light down onto that lovely, dusty old paper. I was greeted by Pierre, tall, slender, and very French in a long-sleeved black sweater, with an offer to help me look for anything special. Casual and friendly, he speaks excellent English and can find most anything in the shop. But since I had no specific requests at that moment, he left me to browse. I spent a couple of solitary hours simply foraging—pawing through stacks of old photos and bags of advertising stickers. I scanned magazines, thumbed newspapers and studied the shelves at random. I could easily have stayed there the whole day, doing just that, forgetting that the beauties of the Louvre and the sunshine of the Tuileries were just a few minutes’ walk away. After a while, Juliette arrived. She’s lean and leggy, with a bouncy energy. Juliette has been working at La Galcante a long time and she seems to love a good hunt. Ask her for a copy of Pilote magazine from 1963, with the serialized story of “Asterix and the Banquet.” Her eyes will take on a moment of intense inner concentration and then off she will go to find it for you. She knows every inch of the place, back to front, and apparently every piece of paper in the shop. If it is there, she will find it. La Galcante first opened in 1975, the brainchild of Christian Bailly, a former journalist and a passionate collector of old newspapers. 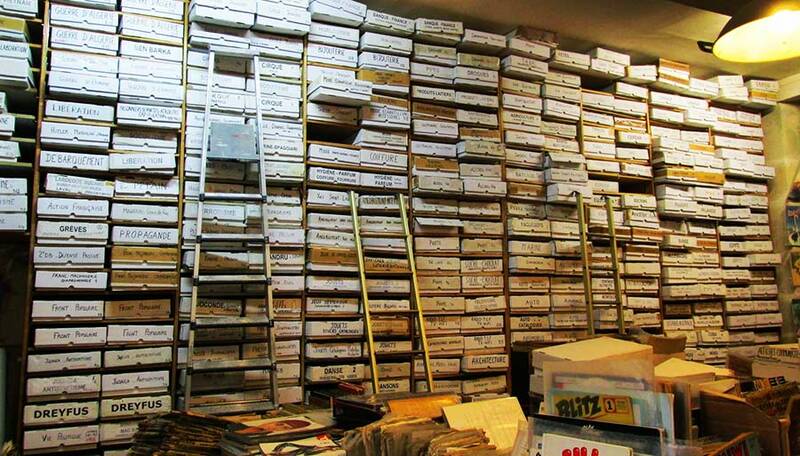 In the 1970s, he inherited hundreds of thousands of the things. He found that newspapers with stories of significant events are easy to sell, but the others? Not so much. So he invented the concept of the “birthday newspaper.” People can ask for copies of newspapers printed on the day they were born, or an anniversary or other fond memory—not a copy but the actual, original paper. The idea is now a significant part of the shop’s business. Magazines are a staple here, all kinds and all eras. There are over 7 million items in the collection. that’s Million! With limited luggage space and a tight-ish budget, I planned only to browse that day. Easier said than done. While it’s true that it’s free to enter the shop and browse as long as ever you like, unpressured and unmolested, temptation lurks on every shelf and table, in every box and drawer. When I finally left, my wallet was 100€ lighter and my one carryon bag just a bit heavier. 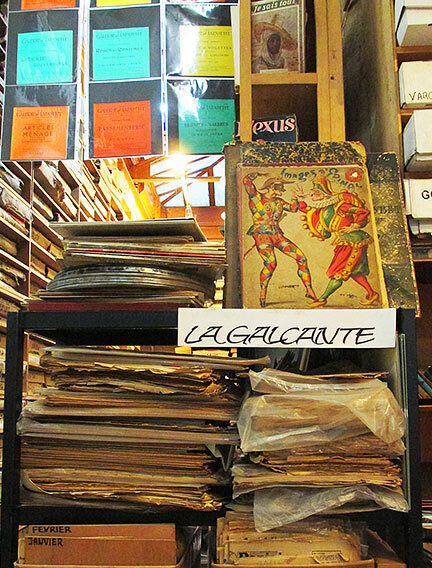 Watch this video to get something of the experience of wandering the aisles at La Galcante. La Galcante | Weld Art Collective from weld art collective on Vimeo. This is, with a doubt, a FIND. I’ll put it on my list along with Blackwell’s in Oxford. LOVE to poke through special places off the beaten path. Thanks for sharing. Thank YOU, Janet. I agree, it is these special “finds” that get passed around among friends that make a visit to anyplace unique and special and YOURS. I’m obsessed with papers, notebooks and such. I actually gasped a little to see this place. And I love your storytelling, by the way. I felt like I was there seeing the motes of dust flitting in the light as you browsed the shop. Thanks Janie! I know exactly what you mean about that particular obsession. As a bookbinder and paper artist myself, I also gasped when I first read about this place. And when I walked in the door? Absolute heaven. I was completely lost for hours!